Happy Sunday morning to you! I thought I had better get my act together pronto after being away for the last two weeks, and this soup seems the perfect way to start – the broccoli and intense iron-rich spinach are enhanced with sweet onion and leeks, then given a l’il kick with fresh mint, a hit of fire from cayenne pepper, and brightness from zingy lemon. It has a healthy yet comfy feel-good factor that works like magic for a Sunday night, easy dinner. The blue cheese, walnut sourdough toasts are a whole different thing – pure indulgent naughtiness – they’re bloody brilliant with the soup (or French onion, mushroom, cauliflower or chicken soups) but are equally good served as a snack with early evening drinks, seriously, let me know if you give them a try, you won’t regret it! Put the oil and butter in a large heavy based pot and heat together until melted. Add the onion and leek and season well with sea salt and freshly ground black pepper. Cook over a medium heat for 8 minutes until soft but not coloured. Add garlic and cook a further 2 minutes. Add potato and broccoli stalks and stock and bring to a gentle boil for 15 minutes. Add broccoli florets, cook for 5 minutes, then add spinach and cook a further 3 minutes. Remove from the heat and add 3 tablespoons of the cream, mint leaves, cayenne and lemon zest. Use a stick blender to whiz until smooth. In a small just whisk the remaining cream and yoghurt. 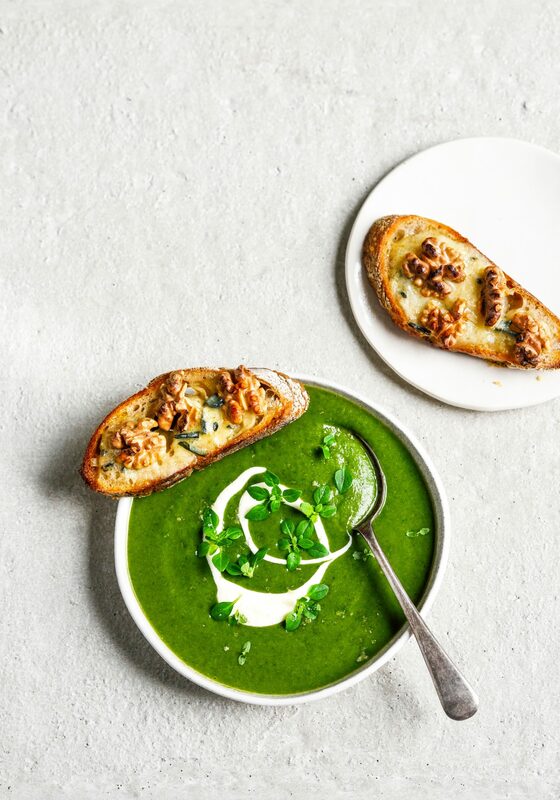 Serve the soup with a swirl of cream mixture, a sprinkling of sea salt and black pepper and some fresh soft herbs such as parsley, mint or basil. Preheat the grill and put the sourdough slices in an even layer on an oven tray. Grill until lightly golden then turn over and spread with blue cheese. Divide walnut pieces over cheese and grill until the cheese is melted and the walnuts lightly toasted. Super green it is to look at and yummy to think of. I like the mint addition, it must kick it up a notch. The toast sounds like the perfect match for this one. Still too bloody hot here for a soup, but a definite must make for those cooler days coming. Hope you give it a try when the weather cools down! I am so making this. The colours are stunning and I know it will be delish as are all of your dishes! Onto 2nd batch of this beautiful soup – tasty as, thank you for sharing. The whole family absolutely loves this soup. My 5 yr old calls it “Hulk Soup”. Thanks!